The new edition of NIH MedlinePlus magazine covers celiac disease, COPD, as well as asthma. 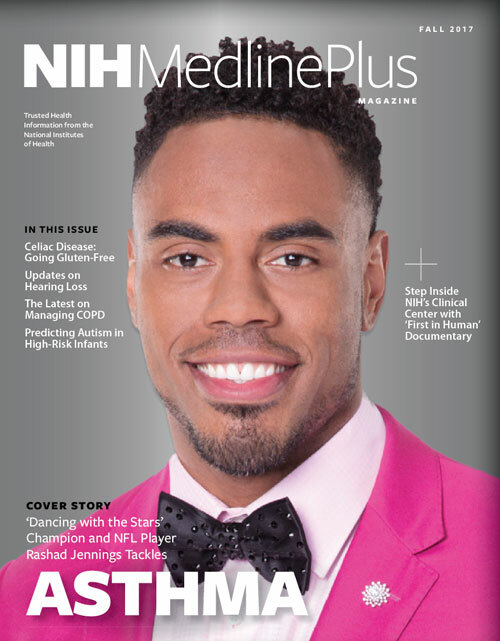 The cover features pro football player and 2017 'Dancing with the Stars' champion Rashad Jennings, who explains the impact of asthma on his life and career. Jennings says (and we quote): '...I want (kids) to know that because you have asthma doesn't mean you are asthma. It is something you can overcome. It is something you can live with. I am a living example of that. By taking the proper measures you will get strong; you will get better.' (end of quote). Jennings helps the Allergy and Asthma Foundation of America raise awareness about the disorder, which impacts about 24 million Americans. To reduce indoor allergens that trigger asthma attacks, NIH MedlinePlus magazine suggests you use (among other things): HEPA air filtration devices; wash sheets and blankets in hot water weekly; place mattress, pillows and box springs in allergen-proof covers; and reduce inside room humidity to less than 50 percent. NIH MedlinePlus magazine reports NIH is sponsoring an array of asthma related studies. One of NIH's studies focuses on following the microbial makeup of the environment among asthma patients and how it impacts participants for several years. NIH MedlinePlus magazine also reports NIH has started a National Action Plan to assist adults with chronic obstructive pulmonary disease, or COPD. COPD also is known as emphysema as well as chronic bronchitis. NIH MedlinePlus magazine notes the National Action Plan will coordinate a range of COPD research and educational activities for the first time. NIH MedlinePlus magazine reports 16 million Americans have been diagnosed with COPD, which kills more than 150,000 persons annually. NIH MedlinePlus magazine adds COPD is the fourth leading cause of disability in the U.S. and its patient care is projected to cost $49 billion within the next three years. The director of NIH's National Action Plan tells NIH MedlinePlus magazine (and we quote): "While there is no cure for COPD, optimal medical therapy can improve the symptoms and the quality of life for patients' (end of quote). NIH MedlinePlus magazine additionally provides a section about celiac disease, which is a digestive condition and autoimmune disorder that impacts the small intestine. NIH MedlinePlus magazine suggests celiac disease can be countered by following a gluten-free diet and early treatment. NIH MedlinePlus magazine adds celiac patients need to be careful to avoid gluten in foods as well as in products such as soaps, lotions, and lip balm. NIH MedlinePlus magazine concludes (and we quote): 'A gluten-free diet is the only treatment for celiac disease that has been approved and is safe and effective' (end of quote). NIH MedlinePlus magazine also provides a section about hearing loss and other medical research developments for middle-age weight gain and the link between genetic mutations and increased vulnerability to a common cold. Other articles in the current NIH MedlinePlus magazine include progress to treat breast cancer. As always, NIH MedlinePlus magazine provides a helpful list of phone numbers (many of them a free call) to contact NIH's array of institutes and centers. NIH MedlinePlus magazine is distributed to physicians' offices nationwide by the U.S. National Institutes of Health and the Friends of the National Library of Medicine. You can subscribe or find the latest edition online by clicking on 'Magazine,' which is on the bottom right side of MedlinePlus.gov's home page. Previous editions of NIH MedlinePlus magazine are available at the same site. A link to NIH MedlinePlus Salud, which provides other health information and resources in Spanish, is available there as well (see the top right of the page). The web version of NIH MedlinePlus magazine includes links that visually supplement the information in some articles — and now include some animations. It was nice to be with you and our best wishes for the holiday season. Please join us here next week and here's to your health!